An excellent, all-around great tomato. ‘Pink Girl’ is ideally sized for slicing, great tasting, incredibly prolific and displays good disease resistance. The juicy pink fruits are low in acid with a mild, sweet flavor. Vigorous plants require staking or caging due to plant size and the large number of tomatoes hanging off the vines . Indeterminate vines produce a continuous supply of fruit right up to frost. Can be eaten fresh off the vine or used in salads and cooking. Excellent for flavoring a variety of dishes. Preserve by canning, drying, or freezing. Wash fruits, vegetables and herbs thoroughly before eating. Use a fertilizer formulated for vegetables. Place in a sunny location after the threat of frost has passed. Best in organic-rich, well-drained soil. Keep soil moist, watering freely in dry weather. 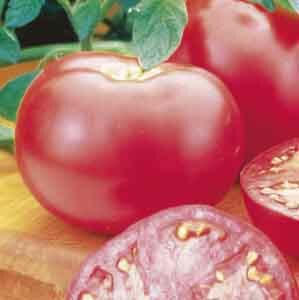 Tomatoes growing in containers may need more frequent watering than those planted into a garden. Harvest as needed. Select a sunny site, away from trees and close to a water source if possible. Prepare the garden by breaking up the existing soil (use a hoe, spade, or power tiller) to a depth of 12-16” (30-40cm). Add organic matter such as manure, peat moss or garden compost until the soil is loose and easy to work. Organic ingredients improve drainage, add nutrients, and encourage earthworms and other organisms that help keep soil healthy. Give plants an extra boost by adding a granulated fertilizer formulated for vegetables or and all-purpose feed (such as a fertilizer labeled 5-10-5). Check the plant label for suggested spacing and the mature height of the plant. Position plants so that taller plants are in the center or background of the garden and shorter plants in the foreground. Plan ahead for plants that get tall and require staking or support cages. It's best to install cages early in the spring, at planting time, before the foliage gets bushy. Vining vegetables can occupy a lot of space, so provide a trellis, fence, or other structure that allows the plant to grow vertically to maximize garden space. Thoroughly soaking the ground every 2-3 days is better than watering a little bit daily. Deep watering encourages roots to grow further into the ground resulting in a sturdier plant with more drought tolerance. How often to water will depend on rainfall, temperature and how quickly the soil drains. A well prepared planting bed enriched with organic matter such as compost or manure and a mild general-purpose, granulated fertilizer gets plants off to a good start. Give plants a boost later in the season with a fertilizer formulated for vegetables. Fertilizers are available in many forms: granulated, slow-release, liquid feeds, organic or synthetic. Follow the package directions to determine how much, and how often, to feed. Be sure to keep the garden well-weeded. Weeds take vital moisture and nutrients away from the vegetable plants. There are several reasons to prune vegetable plants: to help contain a plant’s size, to promote bushy compact growth, to remove dead or diseased stems, and to promote larger, healthier fruit yields. Flower buds can be pinched off to force the plant energy into fewer fruits that develop faster. Vining plants can become invasive in a confined garden space. If necessary, entire vines can be removed down to the main stem to keep plants under control. Never prune away more than 1/3 of the plant or it may become weak and unproductive. Remove vegetables as soon as they mature. Leaving them on the plant any longer than necessary can affect flavor and texture, and mature fruit steals energy from younger developing fruits.